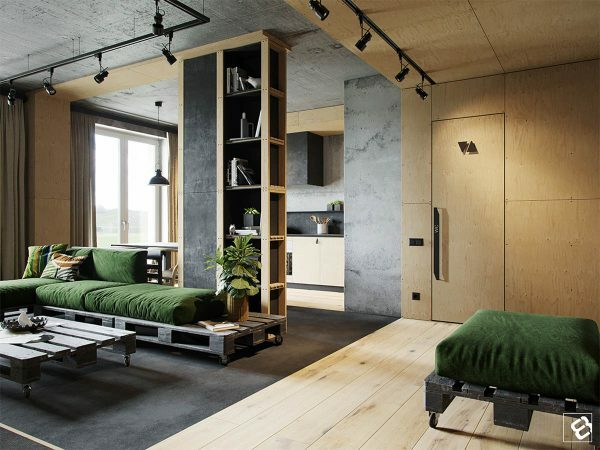 Sometimes a beautiful interior starts with just a single idea. 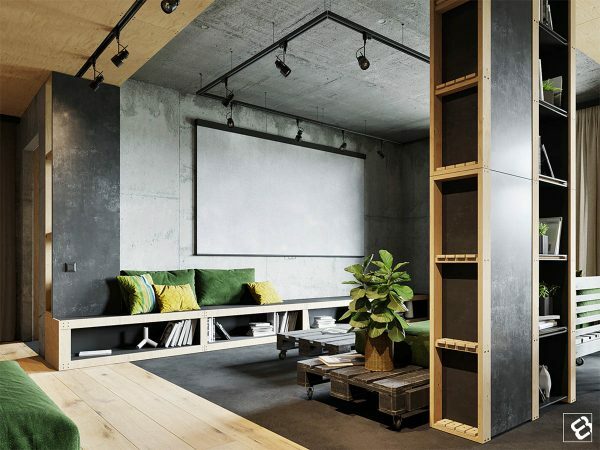 Such was the case with this 72 square meter townhouse in Minsk, Belarus from Visualizer Form’8 Studio. 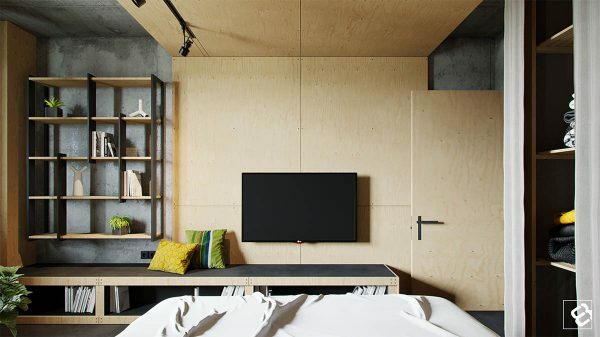 The home, designed for a successful photographer, started with only the elements of wood and concrete. 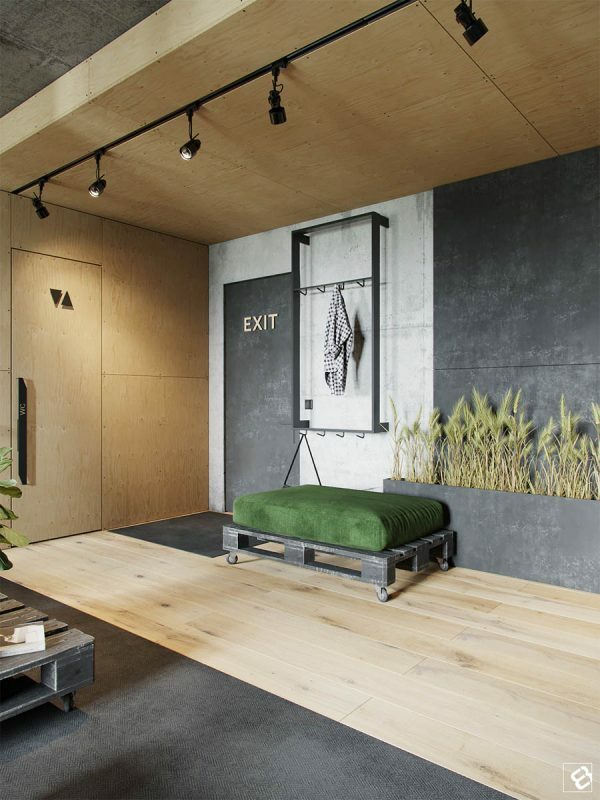 The concrete walls and ceilings are original to the building, while wood flooring, shelving, and cabinetry have been added to create a much warmer feel. 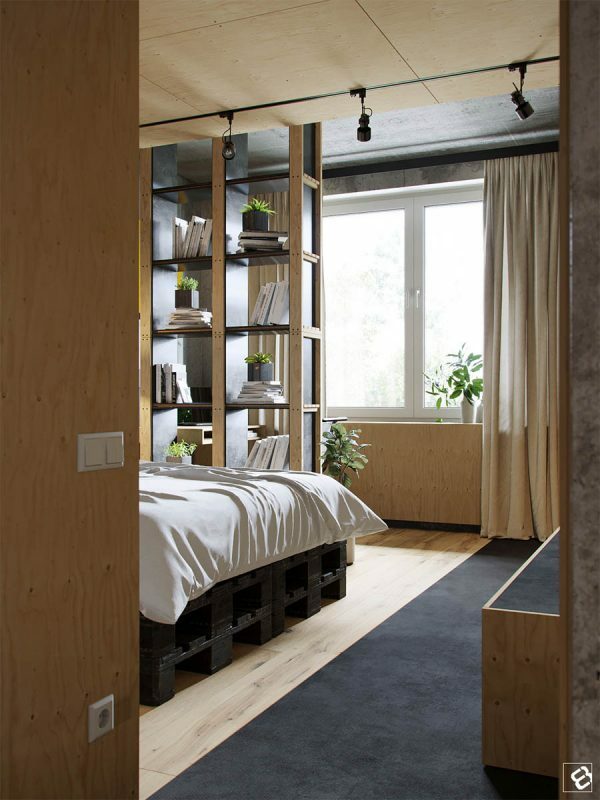 A mix of higher-end items, like luxury dining chairs and more DIY elements like pallet furniture ultimately make for a creative, beautiful space that feels welcoming to its owner as well as to guests that may stop by. 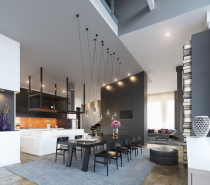 While an open floorplan may not be uncommon in well-designed home, the layout of this space clearly makes it feel expansive and sunny throughout the main living area. 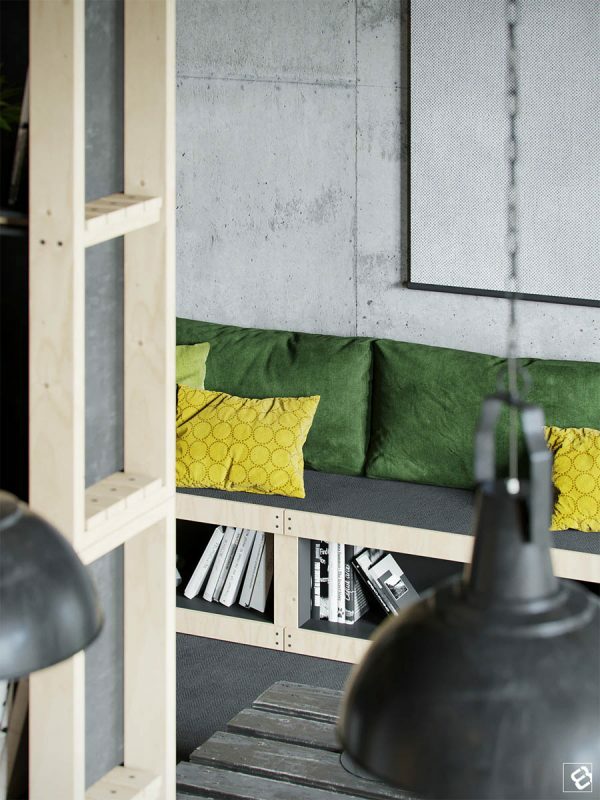 The designers for this apartment left the industrial concrete walls in place and added pallet furniture, which pulls the industrial elements into the living space. 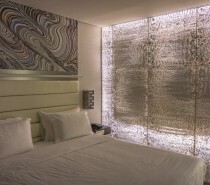 Because the homeowner is a photographer, visual elements like a projector screen are important parts of the design. 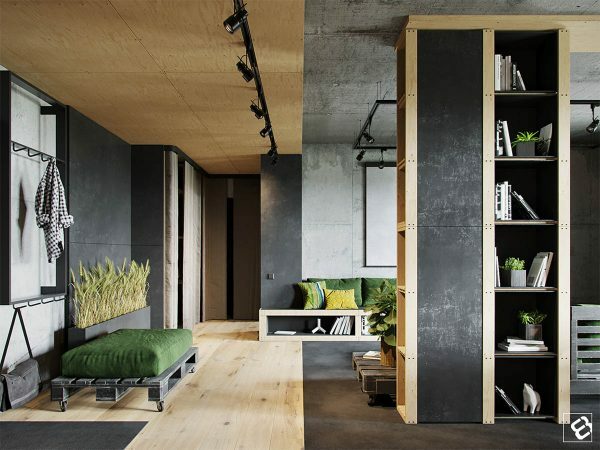 Though minimalism is certainly en vogue, this design has a surprising amount of storage. Using curtains to close off a closet area keeps things a bit cleaner without completely closing off one area. A sheaf of corn, flax and straw adds a particularly interesting decorative element. 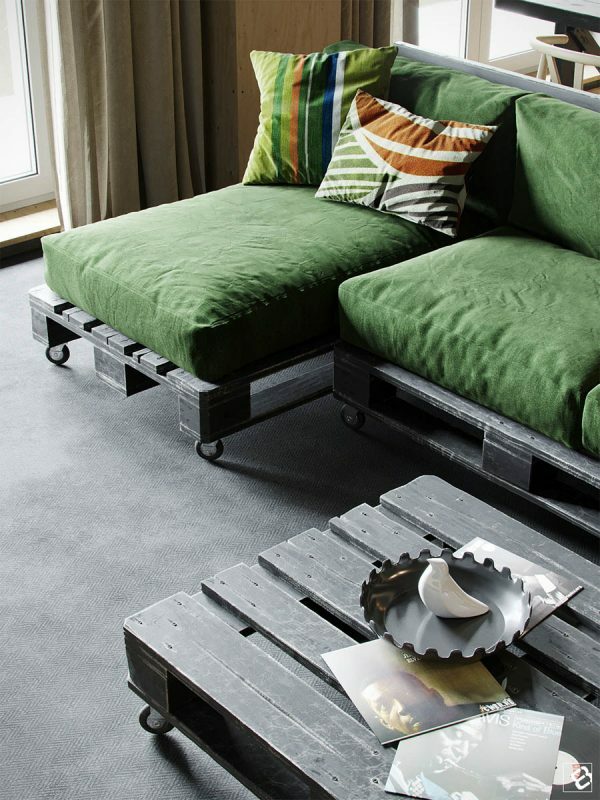 The pallet seating area at the entryway perfectly matches the sectional sofa created in the living room. 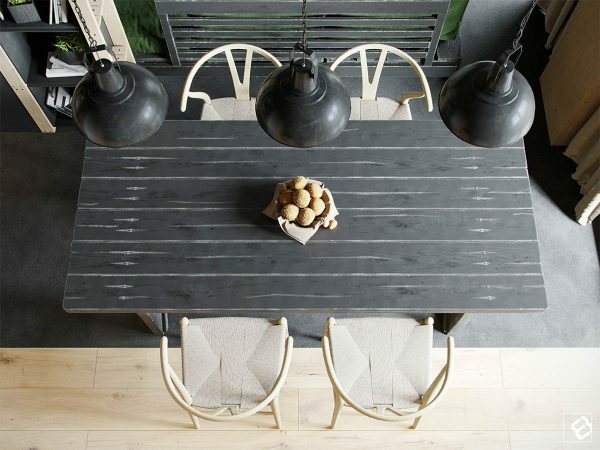 In the dining room, Hans Wegner modern dining chairs are an exceptionally stylish choice. 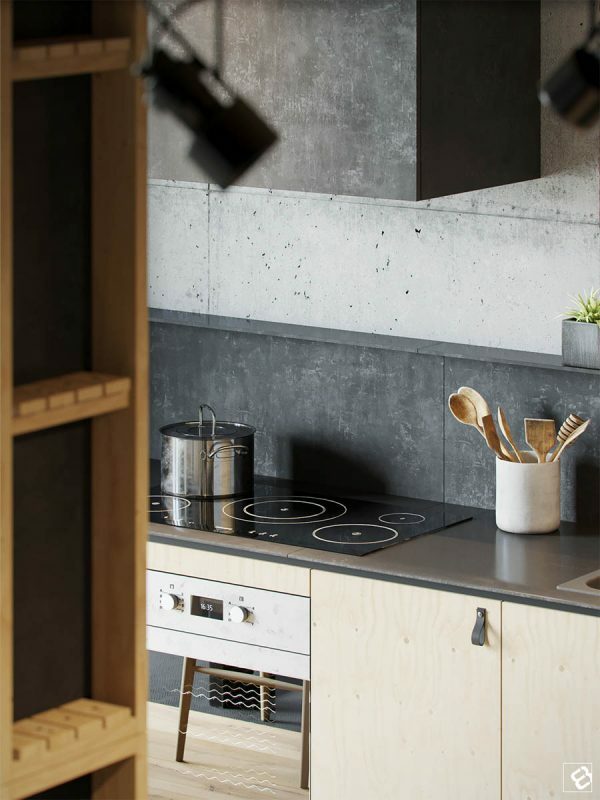 The kitchen makes use of the wood motif with parquet flooring and wood paneled cabinetry. 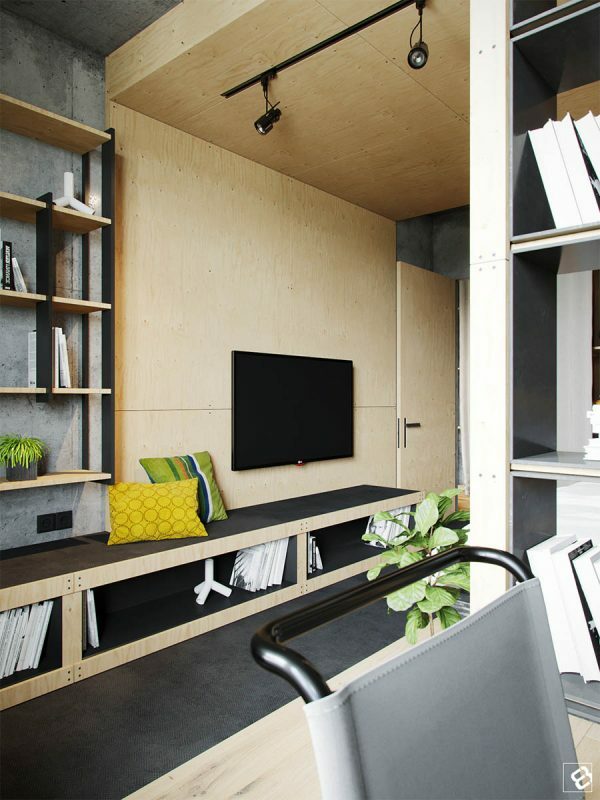 Underneath the custom seating areas is the perfect place for storage of an extensive book collection. 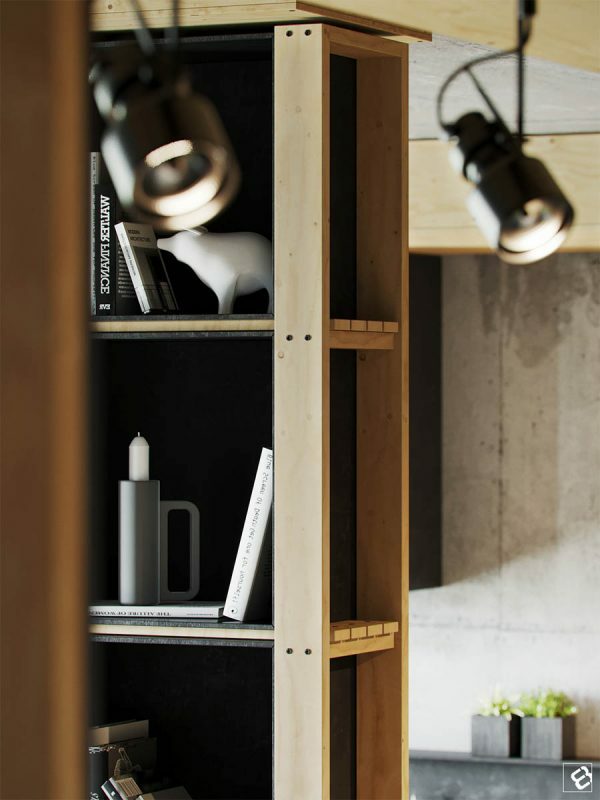 Track lighting was chosen to create an appealing light distribution over the different surfaces and objects around the home. 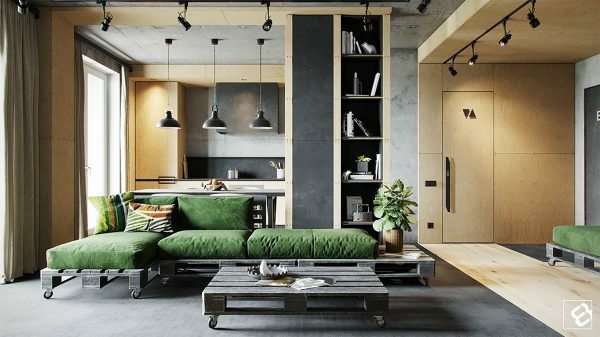 Green is the perfect pop to mesh with the natural color scheme. 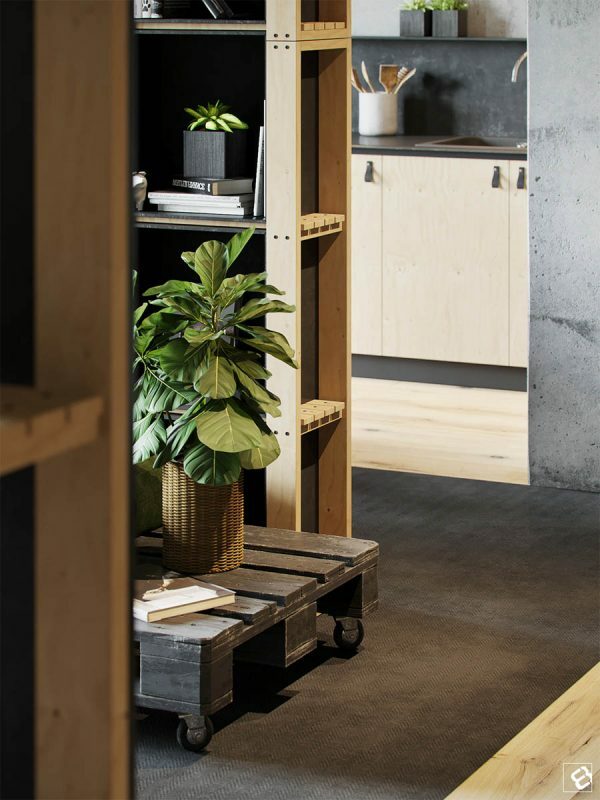 Tall shelving serves two practical purposes — as a room divider as well as, of course, shelving. Carefully chosen tchotchkes make the shelving here a lovely artistic display. 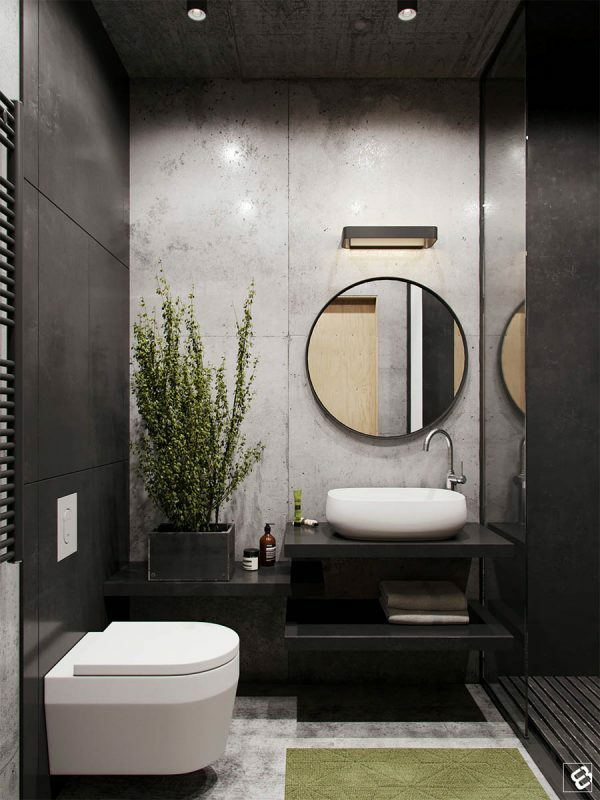 In the bathroom, concrete walls work beautiful with a circular mirror and lovely indoor plantings. 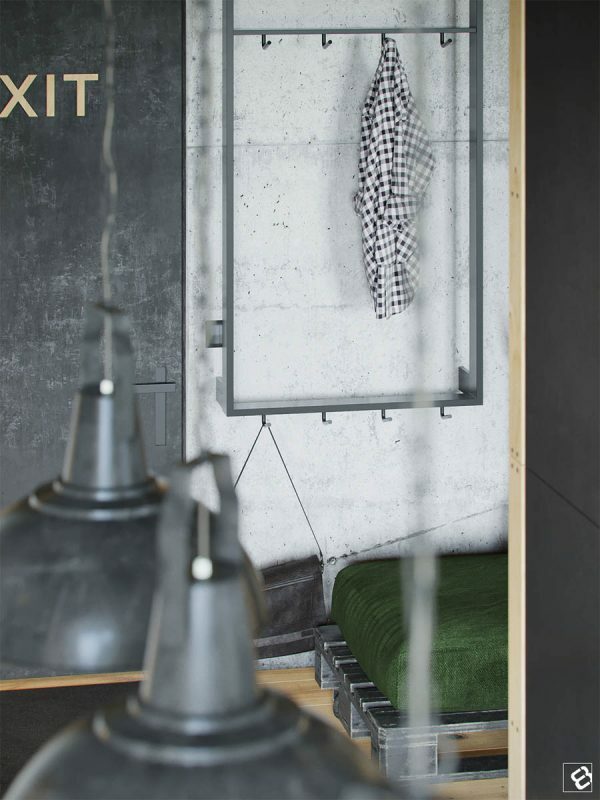 The industrial vibe in the dining room still manages to be welcoming to visitors. 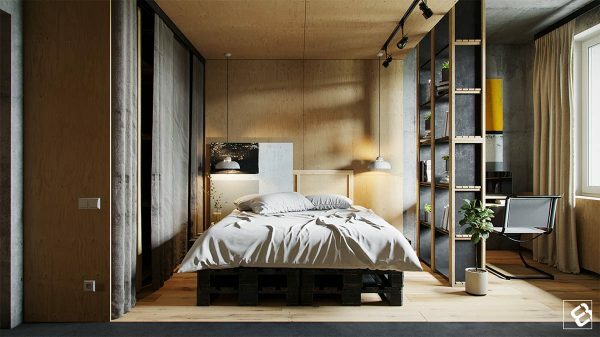 A bed being up on pallets is a solution that is both stylish and affordable. 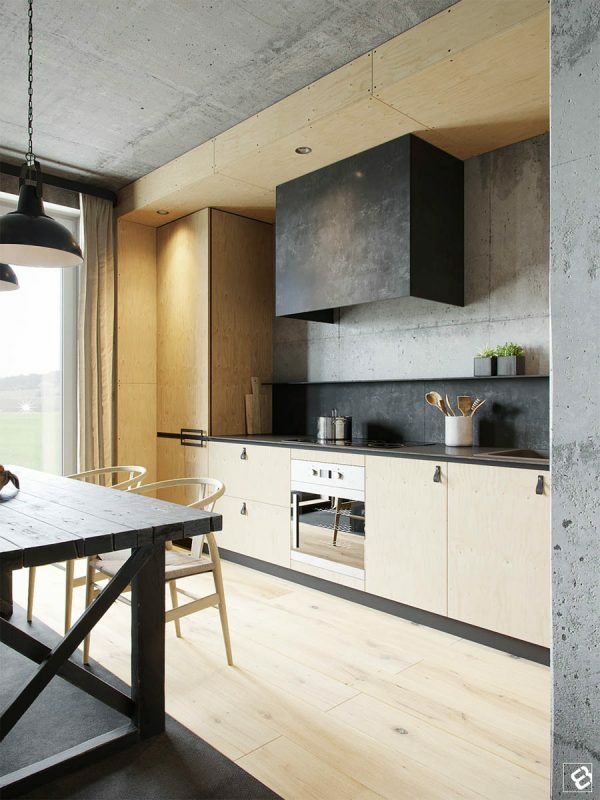 A simple kitchen design is all that’s necessary in this bachelor pad. Original elements to the industrial space like the EXIT sign on the door were kept. 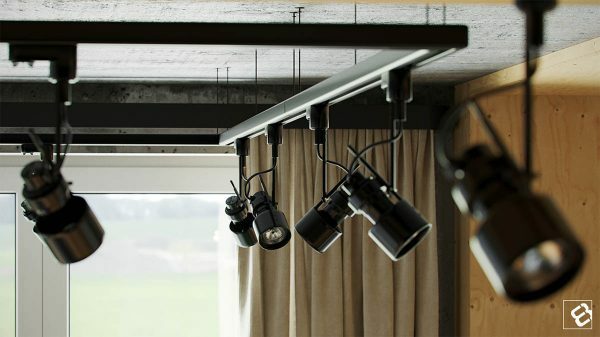 The track lighting is also adjustable when different lighting might be necessary for this photographer. 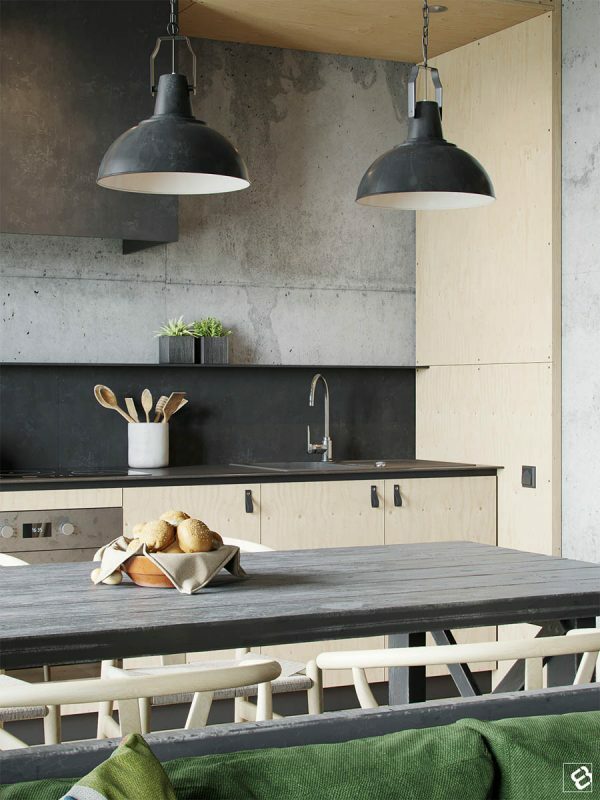 Concrete walls offer a simply imperfect design in the kitchen while industrial style lighting carries through into the dining area. 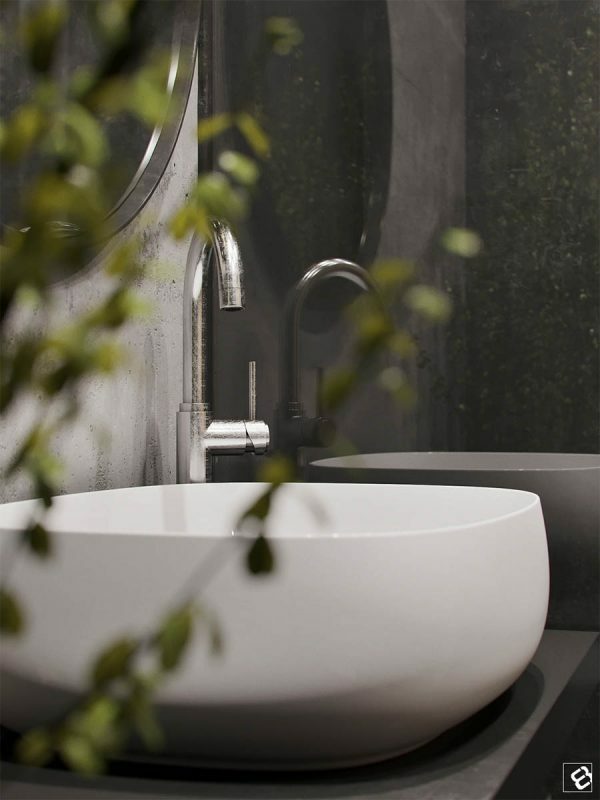 A splash of greenery is always a welcome sight in a bathroom. 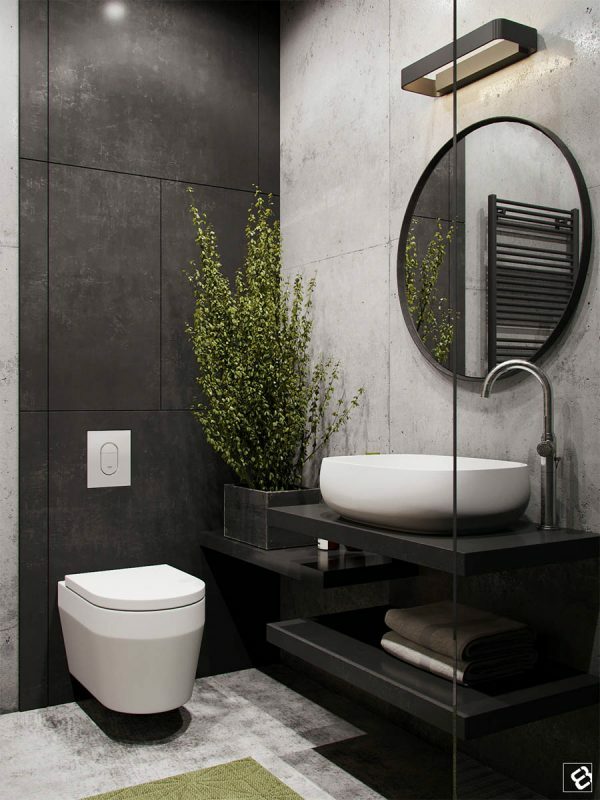 The porcelain bowl sink in the bathroom is a shot of modern luxury in the otherwise industrial home. And out in the main living area, a Fiddle Leaf Fig plant adds to a charming collection of indoor house plants. 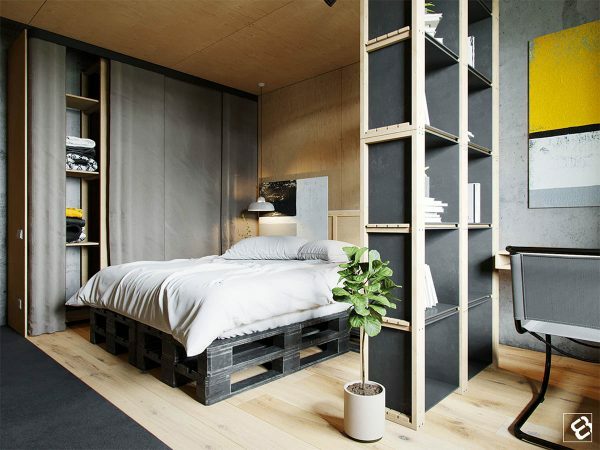 Planters also dot the bedroom shelving and windowsills. 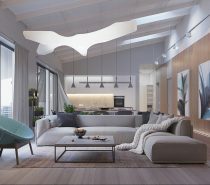 Space for sitting, storage, entertainment, and comfort is all present and accounted for in this cozy townhouse. 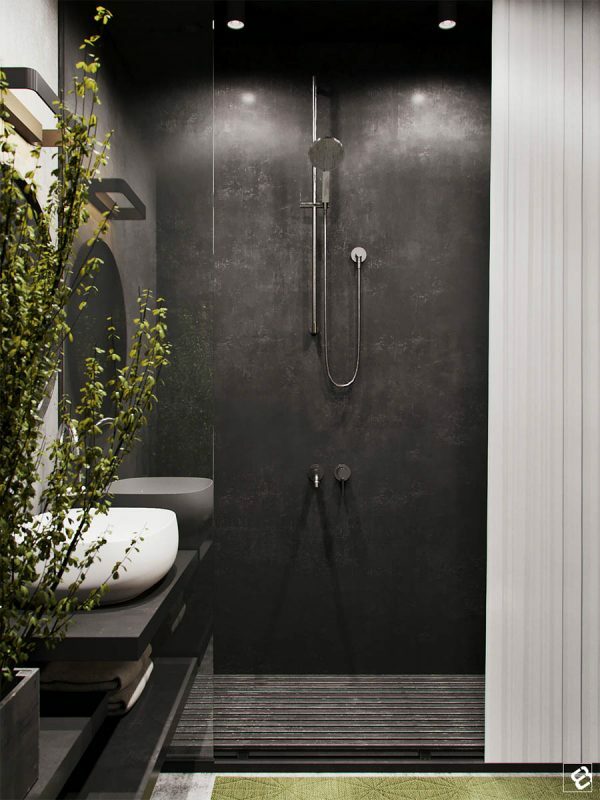 A black shower with wood slat floor perfect mimics the pallet furniture in the main area. 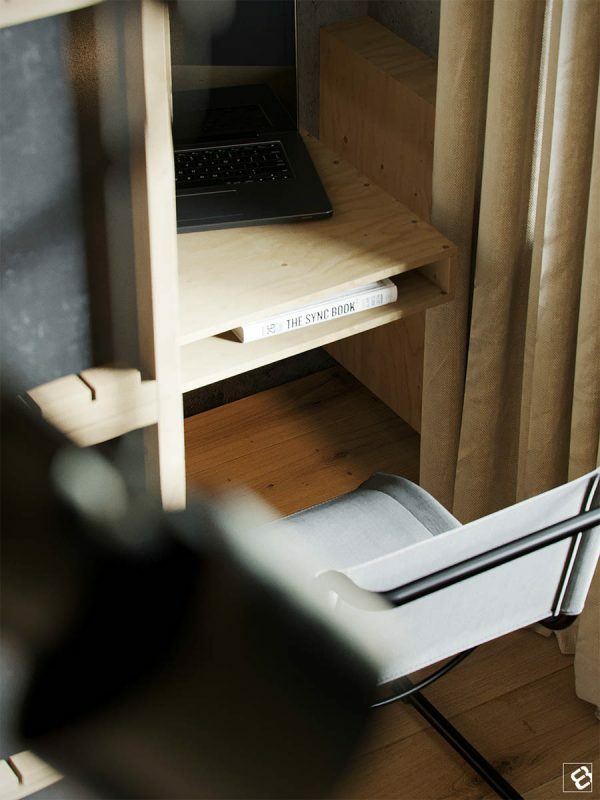 And with the right shelving design, there is even space for a tucked away home office.